Artful Affirmations: Prayer Flags Received-Yay! I would love to share three prayer flags I received in a swap with Creative Lenna! We have had such weather here, that these are yet to go out. There are layers and layers of beauty here, in such a lovely nature theme. The nest of twigs and ribbons at the top are glorious! Thank you so much Marilou! By Donnalee Nichols in Kentucky. 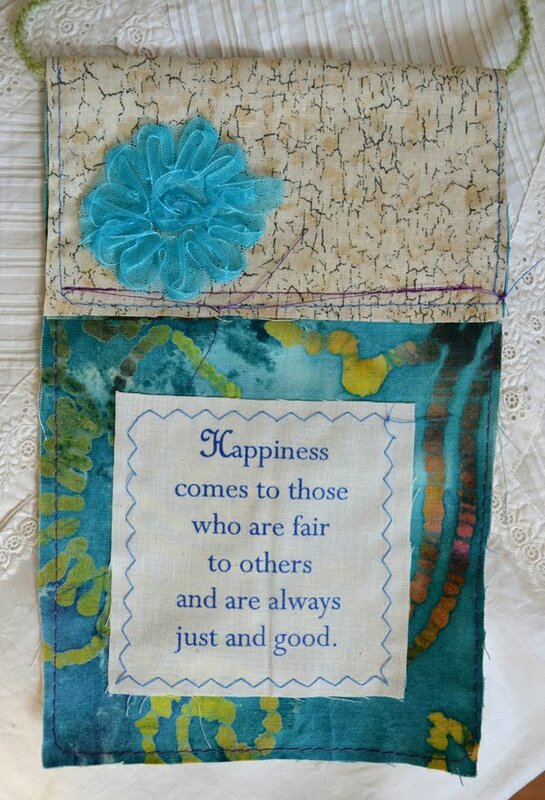 Her personal sentiment is stamped beautifully and the batik fabric is gorgeous! On the back she has stamped the word HARMONY! Thank you so very much Donnalee! 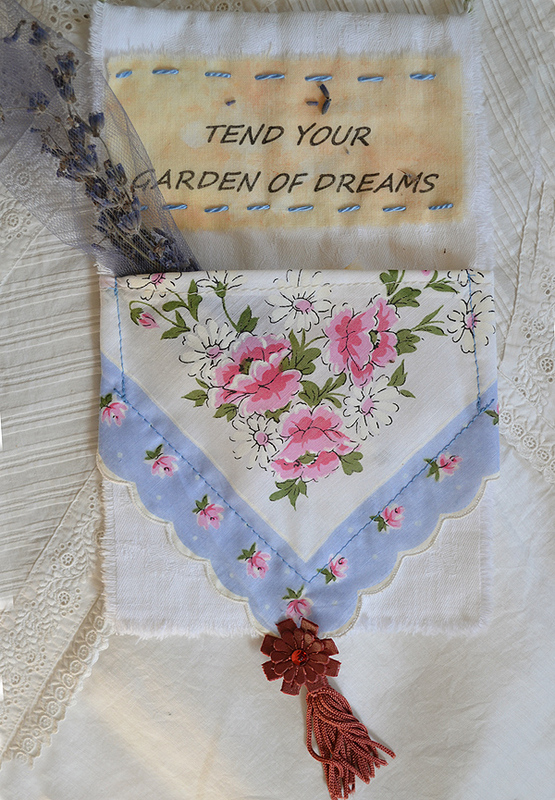 She has used a beautiful vintage hankie, and created a pocket for aromatic lavender! I love "Tend Your Garden of Dreams"! I enjoyed this swap of Prayers very much! Thank you so much Lenna for bringing us together for such a loving swap! this prayer is for YOU. Terri, those flags are all so inspirational. I may have to add prayer flags on my to do list, maybe for spring. Love your blog. Beautiful..they each are all so special and wonderful! Fabulous! and I love yours very much..very inspirational..just like you! Oh, Teri! They are ex traordinary! The three you received, and the one you made- so beautiful! What a NEAT idea -= gosh bloggers are so clever! This is such a gorgeous collection Terri, I am sure it will bring you so much happiness! Each one is so beautiful, and the one you made carries such a special message, and will bring such joy to the recipient! These prayer flags are so beautiful. Thanks for sharing them. What lovely keepsakes, tokens of friendship, and reminders of God's love for us. These prayer flags are so beautiful. What a joy! Wow! What talented ladies! Wonderful swap. Your own created flag, is so beautiful, so stunning dear Terri-and the ones recieved are each special, and lovely .A wonderful swap. Beautiful gifts you have received, Terry! All things of beauty. I love the colour theme in yours and the special touch of the golden dove! you have got wonderful pieces! These are beautiful! Very inspiring and such a splendid idea. I just may have to create a few of these as gifts. I am so grateful that we had this opportunity to exchange flags. I am enjoying mine and wish to thank you once again. Oh they're all so beautiful! This was a fun swap to take part in, wasn't it?! This is such a lovely idea for a swap where you can be creative in such lovely ways. I particularly love Marylou's - the nest part at the top would be a favourite for the birds! And Terri your Healing flag with the lovely angel has real meaning. Terri...those are truly beautiful and this is the first time I have heard of them. What a great idea. I love them all...so creative. Great to see your lovely returns for the swap but my absolute fabourite flag of this post was the Healing one! What a sweet idea! They are all gorgeous! I've never seen these before. They are fantastic! 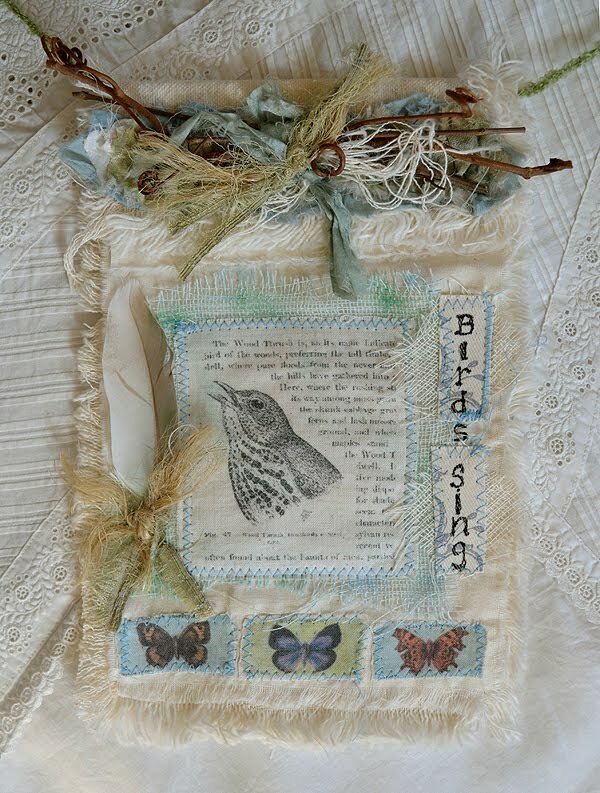 I so love these prayer flags and the whole idea is so very special! What a wonderful thing that Lena organized. 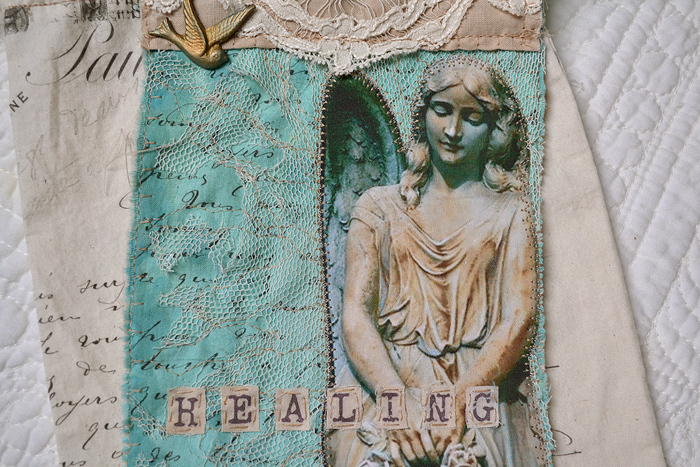 Your last one is just so beautiful - I love anything with tombstone angels and have used them quite a lot in my own artwork. Healing for each and everyone! Thanks sweet woman for the comment you left on my pincushions. Ooops, sorry, wrong spelling, had to delete! These are all wonderful Terri; such a lovely idea. I especially like Marilou's. Inspirational! I am always a dollar short and a day late! But better late than never on commenting on this post! These prayer flags are so inspiring. My oldest son was going through West Nile Meningitis from a mosquito bite at the time of this prayer flag swap. Maybe I'll catch another round on another prayer flag swap at another time. Thank you for sharing the ones you received.